When performance is poor, be it with investments or something in one’s personal life, there is almost always an urge to do something. There is an impulse for action and activity. If something is wrong, we fix it. Why does this occur? As we have pointed out in the past, one theory relates to our ancestry: on the savannah, action was preferable to inaction. If you heard a rustle in the bush it was one of two possibilities: 1) It was a tiger or 2) It was the wind. If you reacted, you may have been running from the wind 90% of the time, but at least the 10% of the time it was a tiger you could get away. If you did nothing, you may have avoided looking foolish the 90% of the time it was the wind but the 10% of the time it was a tiger you were eaten. Point being, action was preferable, and over time those with the quickest reaction survived as one only had to out-react the slowest. However, what worked on the savannah does not work in the markets. On the contrary, when turmoil is present doing nothing is often the best advice. Fidelity conducted a study a short while back with the intention of seeing which of their retail accounts performed the best. They found that people who had actually forgotten about their accounts completely were the clear winners. Basically, the study concluded that over time accounts that were inactive beat the accounts that were active. The chart below indicates how the average investor performed over the last twenty years compared to nearly every other asset class. 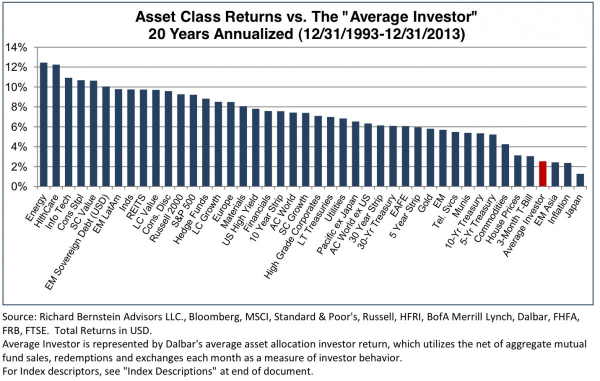 Nearly every asset class over this time period far surpassed the average investor’s returns. Why is this the case? Quite simply, our emotions get in our way. As Richard Thaler points out in “Misbehaving: The Making of Behavioral Economics” this is especially true during periods of significant market volatility. “The paper reports an experiment in which student subjects at Berkeley were given the job of investing the money of a portfolio manager for a university endowment. Of course, they were only pretending to be portfolio managers, but the amount of money they earned in the experiment did depend on how their investments turned out. Their earnings varied from $5 to $35 in less than an hour, so it was real enough for them. As in the previous experiment, the subjects had only two investment options, a riskier one with higher returns and a safer one with lower returns. In this case, what we varied was how often the subjects got to look at the results of their decisions. At its core, Thaler’s research shows that the more frequently you check your portfolio, the greater the odds you set up psychological barriers that inhibit clear thought. There is and always will be a desire for action. However, the point is that one cannot constantly be switching from strategy to strategy, and this is especially true the longer the time horizon becomes. Does this mean one should do nothing? No. Rather, it speaks to the importance of sticking with a plan. Reacting is not investing. Consider the following metaphor: before deciding whether to take a plane, car, train, or one’s own two feet, what must first be decided is the destination. Similarly, before deciding on what investment vehicle to use, one must first determine their financial destination, whether that be retirement, college tuition, charitable giving, a home down-payment, or some other combination. While the plan may and is expected to evolve over time, constantly switching strategies will not help you get to the destination any faster. Getting off at every train stop is only going to slow you down. The more layovers on your flight the longer the overall travel time. The superior (yet more challenging) approach is to sit tight and be diligent about material changes.